The geographical lottery, combined with selective adoption of 'foreign' composers for marketing and promotion, determines which contemporary composers are known and heard in different countries. If you are reading this in UK, Ivan Fedele , a flourishing and prolific composer of notable originality, now in his prime at 50, may be an obscure or even unknown name to you? That he is the equal of several who are feted regularly in this country, with featured exposure in concert series and residencies, I have no doubt. This CD of major orchestral works provides as good an opportunity to begin to catch up as any of the others I have reviewed. I was first introduced to Ivan Fedele by an (until then) little known young Italian flautist, Mario Caroli at a solo flute recital in Strasbourg, and was a little embarrassed to confess I had not previously come across his music. I have taken every opportunity since then to hear Fedele's chamber, orchestral and vocal compositions on CD, and (live) in Stuttgart and Lisbon. It has been a rewarding journey of exploration. Ruah is a concerto for flute, 'the airiest instrument there is - - beyond pure sound breath turns into noise - - free from the influence of traditional modes of expression'. The orchestra provides 'a resonating environment' for the melodies and arabesques of the flute. It is a concerto for the new century, and played here with beautiful tone throughout by Giampaolo Pretto; I did wonder if Mario Caroli might not bring out different qualities, pointing the solo line with more drama and intensity, if he has the opportunity to add Ruah to his repertoire? The cello concerto is a major work in four movements played continuously. Fedele talks about the concept of 'resonance' - the orchestra 'a large resonating space - - an environment reacting to stimuli provided by the soloist'. He contrived that when the whole orchestra plays, it does so with 'extreme separation between the registers' so that the cello would occupy the central space without being covered up; at other times the soloist would 'stay afloat in the treble over the bass (or vice versa) - - in a game of alternation and diversification of harmonic fields between soloist and orchestra'. Having thus so skilfully and scrupulously confronted 'the notoriously problematic relationship between solo cello and orchestra' I felt that he is let down by the technical team which brings the cello a little too forward in this RAI Turin recording; definitely a concerto for an enterprising cellist to take up, and I look forward to hearing it live, in the expectation that balance problems will prove to be solved as successfully as did Dvorak all those years ago! 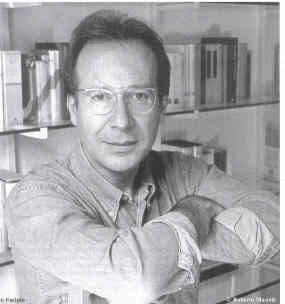 Scena was written for the Scala Milan, and premiered there by Riccardo Muti. It is a theatrically inspired piece with musical figures conceived as 'characters', theatre 'in the world of memory', with references to Italian theatre and La Scala in particular. An absorbing programme, which I have played through twice and will return to again. The music is both complex and accessible, to be enjoyed at various levels by students of contemporary music and by ordinary listeners. - - The most important new work in this concert, and arguably in the festival, was Animus/anima by Ivan Fedele (b. 1953), a major composer from Italy of whom I only became aware belatedly last year through his two CDs, which I have been playing through again and again. A substantial and complex unaccompanied work for seven solo singers, being premiered by members of the Neue Vocalsolisten Stuttgart , it falls into four sections Incipit, Eros, Vox and Anghelos which explore highly differentiated possibilities of homophonic and contrapuntal vocal music. Repetitive at first, after a short time the repetitions are blown apart and give way to narrowest contrapuntal fragmentation, before regrouping into similar or completely new homophonic fields. Very demanding of the highest vocal and ensemble skills, this was presented in an interpretation which pleased the composer, going far beyond unravelling of the score. 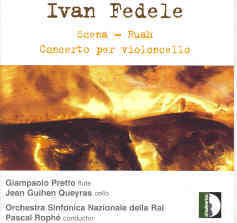 There are two CDs available of music by Fedele, including a piano concerto with Bruno Canino as soloist Stradivarius STR 33348 ***** . A CD of the Stuttgart performance of Animus/anima (which will be broadcast by SWR2 on 24 April) would be particularly welcome, possibly coupled with a forthcoming Flute Concerto by Fedele due from Mario Caroli ?